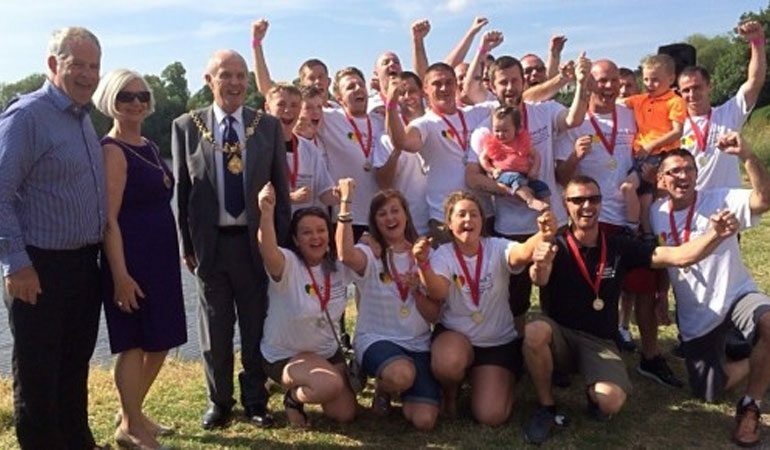 Home / Charity / High Access – Dragon Boat Champions 2014!! High Access – Dragon Boat Champions 2014!! So it was that time again, the Chester Dragon Boat Festival!! On Sunday 22nd June twenty six teams competed in what was the largest dragon boat event in the North West this year, and all for great causes. The High Access Dragons were taking part on behalf of Brainwave, a Charity that exists to help children with disabilities and additional needs to achieve greater independence. We were particularly looking forward to competing against our friends at J Mills, who were making their debut appearance in the event. Each team had three timed races during the day, with the four fastest teams overall qualifying for the Grand Final. Our second race of the day was extremely close with the J Mills Jets beating us by just ‘0.0026’ of a second. However we were still fast enough to secure a place in the Grand Final, where we took it to the next level. Our Dragons sailed away with it in the final, clocking an impressive time of 1.04.24, to be crowned champions!!! We were presented the trophy by the Mayor of Chester and also appeared in the Chester Chronicle. It was a fantastic day for everyone involved and we can’t wait for next year, where we will be going all out to defend our crown! !